The human hand is durable yet sensitive. Nerve endings are concentrated in the hands so we can feel the slightest variations in texture, pressure and temperature. This makes the hands an especially good place to massage using pressure points. 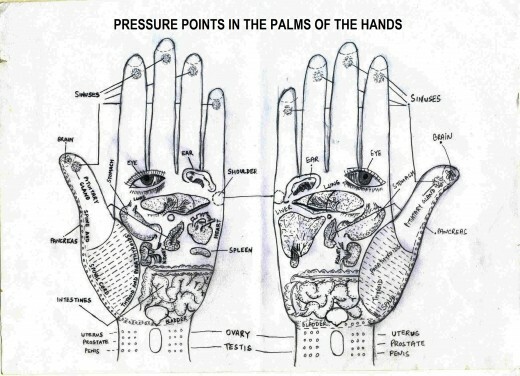 These massage pressure points in the hand are easily found and manipulated if you know where to look. Find the pressure point in the hand between your index finger and your thumb. The thick muscle above the webbed skin is loaded with nerve endings. Feel the bones of your hand as they stretch from your fingers toward your wrist. Locate the juncture where your thumb bones meet your index finger bones; the pressure point is located just above this in the fleshy portion of the hand. This pressure point is used during massage to encourage tranquility and ease ailments of the back, neck and head. A useful massage pressure point in the hand is found by following the line of the pinkie finger toward the wrist. Stop when you reach the point where your wrist meets your palm. You should feel a small gap where the ulna bone in your forearm intersects with the carpals or your hand. Applying massage pressure to this location to encourage relaxation and clear thoughts. The massage pressure point at the base of the hand near the thumb is said to help with breathing difficulty and skin problems. It is also said to help with spiritual longing and bad feelings. The pressure point is found by tracing a line from your thumb toward your wrist. Find the small gap between the carpal bones of the hand and the radius bone of your forearm. Pressing this pressure point should make your hand go slightly numb. Locate the massage pressure point in the thumb. It is found on the outside lower corner of the nail. This will be a different side depending on which thumb you are using. On the right thumb nail, it is located on the lower left. On the left thumb nail, it is located on the lower right. This massage pressure point is said to relieve negative emotions.